The Commission was charged to recommend a civilian space program that will advance the broader goals of American society in the next century. We have therefore considered the United States in terms of its heritage, its likely future goals, and its potential impact on world history. We have also considered our planet’s changing social, technological, economic, and political environments over the next 50 years, and how these will affect America. Simple extrapolations of current trends are clearly inadequate. We must stretch our minds to evaluate such factors as expected population growth, technological progress, geopolitical stability, changing national values, and the strength and vitality of die U.S. economy. For example, will tomorrow’s leaders represent an outward-oriented America that welcomes change as opportunity, or an inward-looking Nation that reacts to change as a threat? Will the United States accord high priority and sustained support to preeminence in science, technology, and exploration? Will rising productivity and competitive strength in world markets still motivate America? Or will zero-growth, increased leisure, and risk avoidance replace America’s traditional expansiveness? To address these questions, Commission members drew on their knowledge of broad based projections, weighed the opinions received from citizens in Forums across the country (particularly from the many young people who participated), took testimony from experts in critical technical fields, initiated a historical review of two centuries of national and world economic growth by Herbert Block, and met with a group of U.S. futurists to discuss their views of the 21st century. From these activities a vision of the next 50 years emerged that provided a basis for our recommendations. Dispassionate studies of the future environment are rare. Like the proverbial blind men groping to describe an elephant, studies of 21st-century America produce divergent views reflecting the perspectives of the authors. Complex computer models simply compound the confusion. In The Two Cultures, Lord Snow observes that non-technical writers often project a pessimistic view of the future, based on their suspicion of human irrationality and dehumanizing bureaucracy (e.g., 1984, Brave New World), while technically-oriented writers often paint a rosy picture of advancing science and technology rationally applied for human benefit in a global enterprise (e.g., 2001, The World, the Flesh and the Devil). To us, history demonstrates that while human nature changes very little, technological advances can initiate revolutionary social change. Not surprisingly, our technically-oriented perspective leads us to envision a progressive 21st-century America boldly leading humanity outward on the space frontier. We live in an era of remarkable change. A 1976 study by the late Herman Kahn and staff members of Hudson Institute presents alternative views of our planet’s next two centuries, ranging from pessimism to technocratic optimism. Their book, The Next 200 Years, is based in large part on an analysis of the technical, economic, and social changes that have taken place in the developed countries since the start of the Industrial Revolution in late 18th century Europe. A more recent study reviews comparative world and national growth rates for population and economic output since 1800. Because comparing different eras and national economies involves complex problems of concept and methodology, results can be ambiguous. Taking this into account, we estimate that in 1800 our planet’s total population was about 900 million people, 10 percent urbanized, producing a Gross World Product (GWP) of about $350 billion, or $390 per capita (all monetary units in this section are in 1985 U.S. dollars). We estimate today’s world population at 4,845 million people, averaging around 40 percent urbanized, producing a GWP of about $17,300 billion, or $3,510 per capita (almost the U.S. per capita income of 1900). In other words, after many centuries of relative stability, the first 200 years of the Industrial Revolution have seen the population of the world multiplied about 5.4 times, Gross World Product about 50 times, and GWP per capita about 9 times. Since 19501 the world’s population has almost doubled from about 12,549 million to 4,845 million people, while the Gross World Product has quadrupled from $4,028 billion to $17,300 billion, and GWP per capita has multiplied two and one quarter times from $1,590 to $3,510. This momentum promises to continue through the next 50 years, but with uneven progress in different economies. Figure 4 [not included here] provides a sense of historical perspective by depicting comparative real economic growth rates over the last 50 years for 12 nations across the development spectrum in terms of Gross Domestic Product per capita. As the figure shows, some countries, such as West Germany, Japan, and Singapore, are achieving relatively rapid rates of economic growth, surpassing the per capita incomes of other countries with long histories of higher ranking positions. Virtually no one looks on such statistics as ends in themselves, but they do correlate with other social measures to indicate nations whose citizens will enjoy greater opportunities and higher standards of living. One quarter of Earth’s population now lives in the 80 percent urbanized and industrialized nations of Europe, North America, Australasia, and Japan. This group enjoys a Gross Domestic Product per capita of more than $10,000 and a life expectancy 50 percent greater than that prevailing in the least developed nations. The uneven progress of economic development is reflected in a roughly 50:1 disparity in productivity and wealth between modem and traditional economies. In spite of this gap, the impact of science and technology is felt in every nation. Witness, for example, the unprecedented global medical campaign that has completely eradicated smallpox from our planet, and the proliferating “Green Revolution” that in the space of two decades has made possible a grain surplus for a third of the human race in Asia. Because many of the new nations that gained their independence after World War II are smaller than previously industrialized nations, international trade is critical for their economic growth. Developing nations need ready access to the technology, capital, and markets of industrialized nations. With good management sustained growth can then be achieved, as demonstrated by Japan and more recently by the four newly industrializing economies of East Asia: South Korea, Taiwan, Hong Kong, and Singapore. Indeed, the most significant socioeconomic trend of our times may be the interaction of Western industrialization with Asian culture. The success of combining Eastern drive with Western technology may spur greater economic growth for the whole planet, if other nations regard the recent gains of Asian economies not as a threat but as an example and encouragement to raise global standards of living. Moreover, if Beijing’s new leadership, which began in 1978 to emphasize economic development as a pre-eminent goal of national policy, can implement its flexible market policies, China may be able to follow the development path of its East Asian neighbors. This would improve prospects for global economic growth by bringing another quarter of the human race into productive trading and investment relationships with Europe, North America, Australasia, and Japan. The demonstrated rapid growth of national output in well-managed, globally-oriented, market economies. In the next 50 years an increasing percentage of humanity will have the advanced technology, the economic resources, the trained people, and the future-oriented leaders that will enable them to participate in opening the space frontier. To provide further historical perspective for envisioning America’s next 50 years, Table 1 summarizes America’s population and real economic growth since 1800. Similarly, opponents of Secretary of State Seward’s purchase of Alaska from Czarist Russia in 1867 sneered at the transaction, calling the vast territory “Seward’s Ice Box.” Despite such criticisms, a majority of Americans accepted the challenge of the frontier and thrived on it. Indeed, it was the promise of the frontier that brought many of our forefathers to the expanding United States. The half century of U.S. economic growth between 1885 and 1935 was stimulated by a remarkable age of science and invention. During this period advances in medicine and public health reduced infant mortality and lengthened life spans, while scientific agriculture and farm mechanization continuously raised agricultural productivity, releasing labor for better paying factory jobs created by the invention of new machines. The rapid growth of the electrical, chemical, metallurgical, telephone, automobile, entertainment, petroleum, and other industries transformed the U.S. economic landscape, giving Americans increasing freedom of choice and the highest national product and standard of living in world history. The economic growth that accompanied America’s expanding physical, technological, and institutional horizons demonstrates the long-term flexibility and vitality of the U.S. political and economic system. As Table 1 shows, the U.S. national product grew throughout the 19th century and up to World War I by slightly more than 4 percent annually, and from then to 1929 by dose to 3 percent. After a steep decline in the Great Depression, the average growth rate from 1939 to 1986 was 2.7 percent, reaching 4 percent between 1959 and 1973. As we project our thinking 50 years into the future, we should bear in mind that even the most visionary science fiction writer of 50 years ago completely missed the scale of the technical, financial, and managerial resources that would be needed to open the space frontier, and none imagined that these resources would become available by 1960. The Air Age was as young in 1935 as the Space Age is today. “You’ll never get me up in one of those things!” was a familiar cry. The non-fiction best seller that year was North to the Orient, Anne Lindbergh’s account of a pioneering survey of future intercontinental air routes. When the first DC-3 was ordered by American Airways, Director Richard W. Millar asked Chairman Donald Douglas how many he expected to sell, and was told “I’ll be happy if we sell ten!” More than 14,000 were finally produced (including some 2,000 in the Soviet Union and 487 in wartime Japan). With 1935 gross federal receipts of about $35 billion (in 1985 dollars), the most ardent Buck Rogers fan could never have dreamed that within 30 years America would launch Apollo astronauts to explore the Moon, and that the $75 billion cost would represent less than one percent of the U.S. Gross National Product of the decade of the 1960s. The Depression obscured America’s outlook in the 1930s, just as budget deficit headlines can cloud our vision now. America faces critical issues in economic policy today, including the federal budget deficit, exchange value of the dollar, trade barriers and imbalances, Third World debt, unstable oil prices, high levels of corporate and consumer debt, tax policies, and the health of existing loans to farmers, energy companies, real estate projects, and foreign countries. From our 50-year perspective, however, these problems appear manageable in light of the demonstrated long-term vitality and adaptability of the U.S. economic system. We are impressed with the growth prospects of the economy in coming decades based upon the underlying promise of advancing science and technology. According to economist Edward F. Denison, about 30 percent of the growth in U.S. gross national product can be traced to advances in knowledge. The Commission believes that the potential for significant breakthroughs in science and technology has never been greater, from molecular biology and plasma physics to supercomputers and-robotic factories. Applying these myriad opportunities to achieve economic growth will require cooperative interactions between the investment community and research and development innovators in Government, university, and industrial laboratories. It will also require entrepreneurs eager to invest in risky growth industries, a tax policy that encourages savings and investment, and a national acceptance of the social change accompanying rising productivity. The robotics revolution, for example, promises to reduce the percent of the labor force working as factory operators toward the low level now employed in agriculture. This shift will tilt the job market even more toward high-technology industry and services, with major environmental impact on the U.S. educational system. We are confident that American institutions will have the flexibility and resilience to adapt to the changing conditions of the 21st century, and that leadership in pioneering the space frontier will “pull through” technologies critical to future U.S. economic growth, as World War II military developments set the stage for major post-war growth industries. How bright are the 50-year prospects for the American economy? 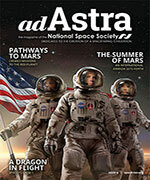 Will 21st-century America be able to afford investment on the space frontier? Will it choose to do so? These questions are as difficult to answer in 1986 as they were in 1935, but we must nonetheless seek reasonable estimates for planning purposes. From our consideration of potential technology advances and the environment of the next century, we believe that are average two to three percent annual real growth in the U.S. Gross Domestic Product through 2035 is a realistic assumption, and we have selected a 2.4 percent annual economic growth rate for our projections. This is probably on the low side; it could well be surpassed if our leadership remains realistic and firm, if U.S. military strength is strong enough to deter threats to international stability (maintaining global tensions within post-World War II limits), if immigration continues, if regulatory and tax reforms move forward, if world trade continues to grow, and if major science and technology advances are pulled through by challenging programs on the space frontier. We therefore believe it reasonable to project a 21st-century America with a 2035 population of 320 million people, a Gross Domestic Product of $12,900 billion, and a GDP per capita close to $40,000 in today’s dollars. Even at our low 2.4 percent annual growth assumption, 21st-century America should be able to afford to lead the world on the space frontier. Our pioneering heritage should certainly encourage us to do so. With the vast resources of the inner Solar System opening for exploration and development, the growth potential for humankind beyond the next century is incalculable. As stated in our opening section, Figure 5 [not included here] outlines on one page the program we recommend to achieve low-cost access to the Solar System. The Highway to Space between Earth and low earth orbit starts with economical cargo and passenger transports, adding an orbit transfer vehicle for destinations beyond low Earth orbit. These three systems would be operational in conjunction with an orbital spaceport by the year 2000. Beyond low Earth orbit is the Bridge between Worlds to support initial robotic lunar surface operations, followed by outposts for human operations on the Moon starting about 2005. Extension of the Bridge between Worlds would initiate robotic exploration of Mars, followed by outposts to support human activities starting about 2015. This phased growth of an economical space transportation infrastructure starts with simple components, for early results, but evolves over time into a powerful network of spaceports, bases, and connecting transport systems that open the space frontier for exploration, science prospecting, initial economic development, and eventual settlement. The three hallmarks of this program are: (1) economy through technological advances that reduce costs, (2) sustained investment to extend capabilities step-by-step, and (3) robotic processing of local resources to “live off the land,” rather than bringing everything from Earth. As pointed out previously, civilian space budgets since 1960 and the estimated cost of our recommended program projected out to 2035 are shown in Figure 6 [not included here]. Allowances have been made for commercial and international participation. The growth of the U.S. Gross National Product for the past 25 years is also shown, with a projection to 2035 at our assumed annual growth rate of 2.4 percent. Note that the percentage of the U.S. Gross National Product invested on the space frontier would remain below half of the peak percentages spent on the civilian space program during the peak Apollo years. In view of the increasing significance of space and the critical economic importance of U.S. scientific and technological preeminence in the next century, we believe that these estimated levels of expenditure are reasonable in relation to the expected benefits to our Nation and the world. The enormous human and economic potential of opening vast reaches of the inner Solar System for settlement in the 21st century can be realized within these budget limits, but an early national decision on the long-range direction and pace of our civilian space program is required. Is our expansive view of America’s future realistic? Are the technical advances we project achievable? Will people accept risks and discomforts to work on other worlds? We believe that the answer to all three questions is “Yes!” Few Americans in the early days of the Air Age ever expected to fly the Atlantic, let alone in jumbo jets or supersonic transports, yet nearly 75,000 people now fly the Atlantic daily. The result of 50 years of cumulative technological progress was impossible to foresee. 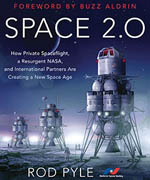 It is equally difficult for Americans this early in the Space Age to visualize the 21st-century technologies that will enable the average citizen to soar into orbit at low cost, to fly to new worlds beyond Earth, and to work and five on the space frontier in dosed-ecology biospheres using robotically-processed local resources. Continuing technological progress in astronautics, robotics, and dosed-ecology biospherics will make this possible. Our proposed civilian space agenda for 21st-century America can achieve our recommended long-range goal of exploring, developing, and settling the inner Solar System with reasonable milestone dates. The emphasis is upon the creation of new wealth rather than the Management of scarcity. We are not proposing to flee mother Earth, but to improve it by removing limits to human growth. The pace of advance we propose on the space frontier is consistent with reasonable budget levels in an expanding U.S. economy. The final decision will, of course, be made by the American people. We should therefore emphasize that: The Commission is not prophesying; it is describing what the United States can make happen through vigorous leadership in pioneering the space frontier. The Commission believes that 21st-century America will still be a vigorous, expansive society, its citizens inquisitive and adventurous, eager for new, challenges in the forefront of humanity. If we are right, the bold space agenda and goals we have recommended will channel a small fraction of this restless energy into extending life outward from our home planet Earth. The required technical, economic, and managerial resources will certainly be available in a prospering America, and increasingly also in other nations. The hopes and dreams inspired by removing terrestrial limits to human aspiration, and the relevance of these hopes and dreams to America’s pioneer heritage. These themes and the broad principles outlined in our opening Declaration for Space can provide a new rationale and direction for our civilian space program. However much the space policies of the past 15 years may have accomplished, we feel that declining budgets allocated annually to competing individual projects without an overall context are inadequate. Longer-range, more visionary leadership is demanded. We urge the Administration and the Congress to work in concert to raise American aspirations and to set new goals for civilian space activities in which planned programs are carefully phased to achieve a well-understood, sustained national purpose. We specifically suggest that the Congressional authorization committees work closely with the Administration to develop a new long-term direction and pace for America’s civilian space program, while the appropriations committees and the Office of Management and Budget concentrate on annual budget reviews and watchdog activities within the resulting agenda and policy framework. We believe that long-range goals established by strong leadership will lead to a better-informed public, improved management of major national assets, accelerated technical progress, more economical operations, and greater private and international participation. We hope that our report will contribute to this longer-range management perspective. Since the 1960s, NASA’s programmatic emphasis has been on the development of the shuttle, and major scientific observatories and planetary missions. While this has unquestionably led to spectacular achievements, NASA has placed such low priority on long-range planning that internal planning work is no longer adequate. We note that the budget for this area has shrunk by a factor of 10, while the agency as a whole decreased by a factor of 3 (See Figure 6). The Commission therefore recommends that: NASA substantially upgrade its emphasis on long-range spaceflight planning studies. We urge NASA to raise the visibility and organizational stature of planning to ensure that the programs we recommend receive continuing and adequate attention; and that NASA operate on the basis of an annually updated five-year budget plan and a 20-year space plan. In the increasingly competitive world of the future, it is clear that maintaining America’s preeminence in science and technology will once again test our Nation’s technical vision, resolution, and institutional strengths. To meet this challenge, we must initiate challenging programs that will attract and motivate the best minds of the 21st century. We must stimulate advances across a broad spectrum of scientific fields and technologies critical to America’s future. With the lessons of history in mind, and with a vision of humanity moving outward from Earth, the Commission recommends a new direction for our civilian space program that we believe will advance the broader goals of 21st-century America: To lead the exploration and development of the space frontier, advancing science, technology, and enterprise, and building institutions and systems that make accessible vast new resources and support human settlements beyond Earth orbit, from the highlands of the Moon to the plains of Mars.